Adam Rosenquist of Stromsburg won $100,000 playing Crossword Inferno from the Nebraska Lottery. Rosenquist purchased his winning ticket from Casey’s General Store at 117 Main St. in Stromsburg. 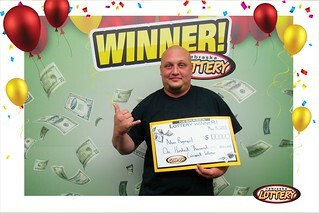 While claiming his prize, Rosenquist told lottery officials that he originally thought he’d only won $1,000 at first. But when he realized he’d won $100,000, “My jaw hit the floor,” he said. Rosenquist said he’ll use the $100,000 to remodel his home. As $10 Scratch game, Crossword Inferno offers players the chance to win prizes from $10 to $100,000. The chances of winning $100,000 are 1 in 171,000 while the overall odds of winning any prize are 1 in 2.71.